This is the script for my presentation at the Osher Map Library and Smith Center for Cartographic Education, University of Southern Maine, on 19 November 2015, on the occasion of the opening of the exhibition, “Masterpieces at USM: An Exhibit Celebrating Five Centuries of Rare Maps & Globes at the Osher Map Library,” curated by Ian Fowler (November 2015 – March 2016). As a script for a spoken presentation there are no notes. Some images have been inserted. This new exhibition asks two questions that are hard for me to answer, at least in my allotted time: why are early maps worth studying, and what map would I have selected to talk about? Put another way: why are maps cool, and what do I consider to be my favoritest map? I have been a student of map history for over thirty years now, and in that time I have explored many reasons why early maps are worth studying, and I have identified many, many favoritest maps. Indeed, as a map historian I have been rather promiscuous in my intellectual affections. Some of my fellow map historians spend their entire lives focused on one genre, one period, one region, even one cartographer. I’ve never had that luxury. Partly because my work here at the Osher Map Library and Smith Center for Cartographic Education requires a wide-ranging interest, but also because I’m just fascinated by maps. All maps. Like almost everyone else who grew up in Great Britain in the twentieth century, I was introduced at an early age to the wonders of Ordnance Survey topographical maps, first at one inch to the mile and then, as here, two centimeters to the kilometer. My friends and I used these incredible maps to go hiking, on the moors and in the forests, and around the coasts. As a student of geography in junior and high school I learned to read these maps for information about the present-day landscape, both natural and human-made. And later on, in college, I learned to read them for their clues to landscape history. As Frederic Maitland wrote late in the nineteenth century, Ordnance Survey maps are an historical palimpsest “waiting to be read.” Armed with these maps, Nikolaus Pevsner’s architectural histories, and W. G. Hoskin’s The Making of the English Landscape, I could study the layers of sequential occupancy, of Celts and Anglo-Saxons, of medieval Norman sheep granges and the effects of Henry VIII’s dissolution of the monasteries, and more especially of the enclosures and improvements of the eighteenth century that so radically transformed the British landscape before nineteenth-century industrialization completely transformed it once again. But well before I ever rambled, map in hand, across the British countryside — and so discovered just how easy it is to mistake the dashed black lines of lesser district boundaries for the dashed black lines of footpaths and tracks — I had at home pulled my father’s atlases from the large bookshelf in the living room. (It wasn’t hard: they were on the bottom shelf!) He had two, one of the world, and one specifically of Great Britain, both made by the venerable cartographic firm of Bartholomew’s on behalf of Reader’s Digest. They matched the ranks of digested novels and sets of Time-Life educational books on the earth and the solar system. I don’t actually know if he ever read either atlas, or indeed any of the digested books, given that he was always reading novels borrowed from the public library, and he might well have acquired them all out of some paternal sense of responsibility for his children’s education. I for one was enthralled by the atlases. I was as obsessed with their regional maps, which I obsessively traced, as I was with their thematic maps of physical and human traits. I was fascinated by a cartogram of British parliamentary constituencies, all the same size to reflect the approximately equal number of voters in each, so that London and southeastern England appear bloated and obscene. Of course it appealed to me. 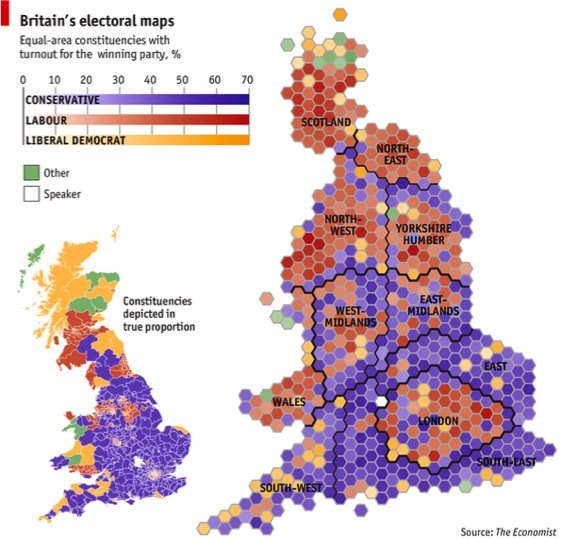 A cartogram of modern UK constituencies: http://www.economist.com/ blogs/graphicdetail/2013/04/mapping-britain. My father also had two books by the inestimable Hendrik Willem van Loon, which he had received as school prizes during the 1930s. One was a history of civilization, the other a geography of the world. My brother, I remember, read them avidly and repeatedly. I too appreciated Van Loon’s rather irreverent text, but I was especially smitten by the images. Van Loon heavily illustrated his many books for young readers with his own, wonderful pen-and-ink drawings. I was especially taken with several of the maps in the geography that Van Loon drew in a rather cubist manner. Even as a child, I found these images weirdly different and liberating: we don’t have to draw the world in a formal way; we don’t have to follow convention; we can take liberties. We can have fun! Today, I can be all intellectual about Van Loon’s allusions to Picasso and Braque and all the other modernists who sought to overturn the tired aesthetic conventions for representing space and time. But even so, these maps still infuse me with that old wonder: wow, how cool! 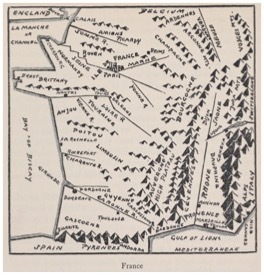 Hendrik Willem Van Loon, “France,” from Van Loon’s Geography (1932). So, I have many, many favoritest maps, both the highly detailed maps that allow us to read the landscape, and the more general maps that allow us to read societies and cultures. I have many most favoritest maps, the ones that speak most powerfully to me; still too many to discuss in detail here. But there is one map that stands out as the proximate cause, over three decades ago, for why I am here today. When I went off to college, I thought that I would become a land surveyor. The geography program at University College London had a sequence of courses in land surveying, and it was just starting to get into digital mapping. I did the sequence, learned to program in Fortran IV, and secured funding for a terminal master’s degree. But, in parallel, I also discovered that the department had a strong emphasis on historical geography, which is to say the reconstruction of past landscapes and spatial practices. 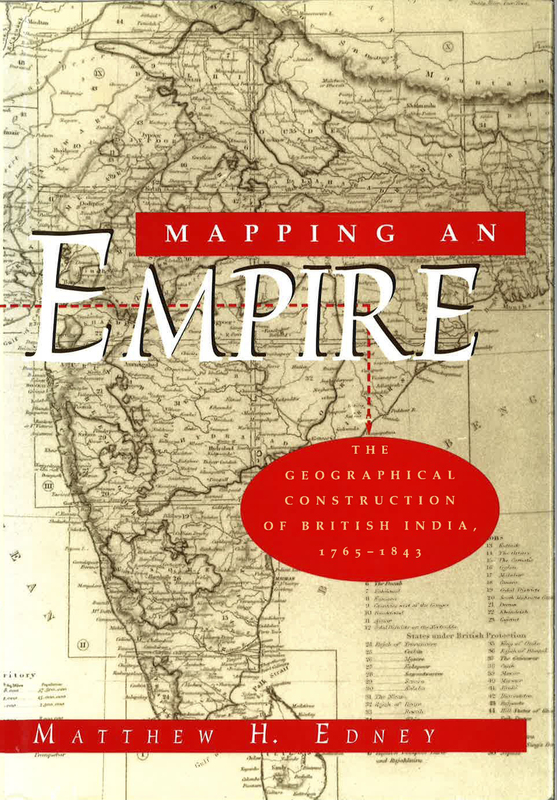 Having abandoned the kind of formal history that was taught in British high schools — it was simply tedious and unenlightening — historical geography was a revelation. And I took all those courses, too. In my last year at UCL, I read an essay by an historical geographer called Brian Harley. His topic was how historical geographers should treat their evidence, and many of his examples concerned interpretations of early maps. Suddenly I saw the way to blend the otherwise distinct parts of my degree: the land surveying and computing on the one hand, the historical geography on the other. I would study map history! And, as it happened, I already had been doing map history . . . I just hadn’t known it. I began reading geography at UCL in 1980; the department had only just moved the year before from the main college campus into a large, concrete and glass building on Bedford Way. The stairwell offered a particularly brutalist mass of concrete. To alleviate the overwhelming and unadorned solidity, the geography faculty added some decoration. In particular, the then head, Professor Bill Mead, contributed a facsimile of a large map. 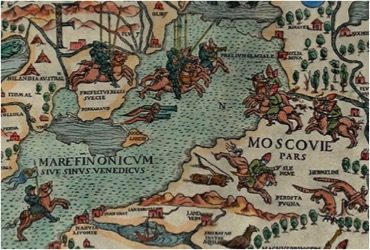 Mead was an expert on the historical geography of Scandinavia, and the facsimile was of a very rare work: the large woodcut Carta marina designed by Olaus Magnus, Catholic archbishop in absentia of Uppsala. Published in nine sheets in Venice in 1539, its title reads in English, “Marine map and description of the northern lands with the most diligent elaboration of the marvelous things contained therein.” Such large maps, I have learned over the years, are highly susceptible to damage and few survive. In this case, the map was long thought to have been lost entirely. But in 1886, an impression was found in the Bayerische Staatsbibliothek in Munich; a second impression came out of the woodwork in 1962 and was acquired, appropriately, by Uppsala’s Universitetsbibliothek. Lacking color, the map presents a baroquely detailed image that suffers from what modern designers call poor figure/ground: it is difficult to tell the figure of the land from the background of the sea. Not only are the sea and land inked with almost equal density, the land takes up only about half of the image and so cannot be visually dominant. To modern eyes trained to look first at map content, the contour of the coastline and the details of the interior are visible only with effort. But, with effort, what is it that our modern eyes see? Scandinavia itself takes up the map’s right-hand half, with the great peninsula of Norway and Sweden in the center curving up and around to enclose the Baltic Sea, with Finland at upper right; below arcs the southern Baltic coast from Russia (and the future location of St. Petersburg) across Prussia to Denmark at bottom center. The left-hand half of the map is taken up with the Atlantic Ocean; running from bottom to top, we see northern Scotland; the overdrawn archipelagos of the Orkneys, Shetlands, and Faeroe islands; and finally Iceland, with a small inset in the top-left corner of the southern tip of Greenland. 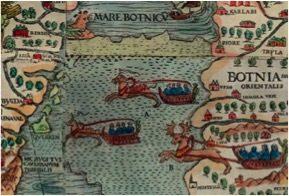 The colored, 1949 facsimile of Olaus Magnus’ Carta marina. From digital version placed online by the James Ford Bell Library, University of Minnesota, Minneapolis. But what Bill Mead used to cover that bleak expanse of concrete in the stairwell at Bedford Way — what I passed several times a day as I negotiated the geography department — was a brightly colored facsimile issued in Stockholm in 1949. The colors are false. Speaking now as an historian, with all the benefit of hindsight, such an imaginative addition of color is an utter no-no. But to a know-nothing undergraduate, the map was striking. Did I say it was large? It stands five-and-a-half feet tall, so framed and mounted on the wall it reached over even my head. It cried out to be looked at, to be studied and examined. It was a wonder. Detail from 1949 color facsimile. There is a grand struggle here, of sailors against the wild ocean, of humanity against nature, of nature against itself. It appeals to the modern viewer, at least in part, because the battles seems to be equal: this is a simpler and nobler age, when humans had yet to harness steam power to dominate the natural world, when whaling was more of a joust than a slaughter. Moreover, these aggressive and exotic monsters adhere to our preconceptions of what early, non-modern maps should have been like: a world barely known and filled with fantastic creatures and fantastic notions. And as Renaissance Europe expanded across the world, they used the fantastic creatures to fill up the blanks in the map between the known places: Here be dragons! But in the Gulf of Finland, the vignette depicts war between Swedish and Russian knights. The map’s land-borne vignettes display a wealth of social commentary, from the illustrations of the Saami in the far north to the standing stones and barrows of the ancient pagan ritual site at Uppsala. The whole map celebrates the political and military status of Sweden, of which Olaus Magnus was himself prelate. So, in late 1982, as I read that essay on how historical geographers could study early maps for social and cultural information as well as for landscape studies, Olaus Magnus’s colorful map was front and center in my thoughts. In writing to the essay’s author, Brian Harley, to enquire about the possibility of undertaking a dissertation with him, I did not mention the sea monsters but wrote at length about the map’s contrasting vignettes of eastward war and westward peace. What I didn’t know was that Brian was just then formalizing the allegorical study of maps. I have to wonder what he thought about this young pup who came out of nowhere to teach new tricks, however inadvertently, to the old dog! I cannot say that Olaus Magnus’s Carta marina is my most favoritest map ever. But it does have a special place in my heart, and I would not say no in the extremely unlikely event that the map library is offered a copy — although we do have a later version, albeit much reduced and without all the vignettes. Yet, now that I know that the map’s colors are false, I have to wonder whether I would ever have been so seduced had Bill Mead hung a straight, uncolored facsimile in the stairway on Bedford Way. It is thus something of a paradox that my entire career as a map historian began with a fake map.